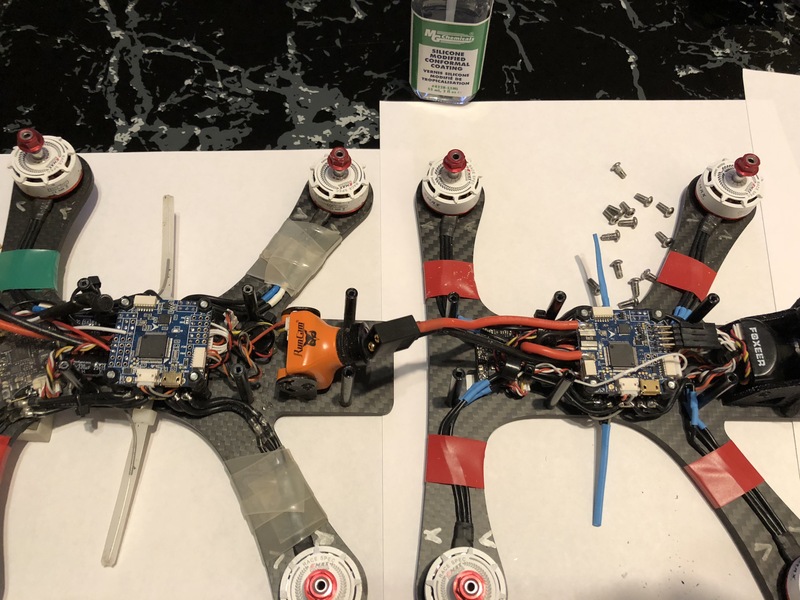 My last two newly built quads are ShenDrone Tweaker 5″ with Speedix 30Amp ESC, Omnibus F4 SD AIO (before ESC’s were integrated as AIO), a RunCam Owl 2, 2306 EMAX 2400KV motors. Names Faith and Charity. 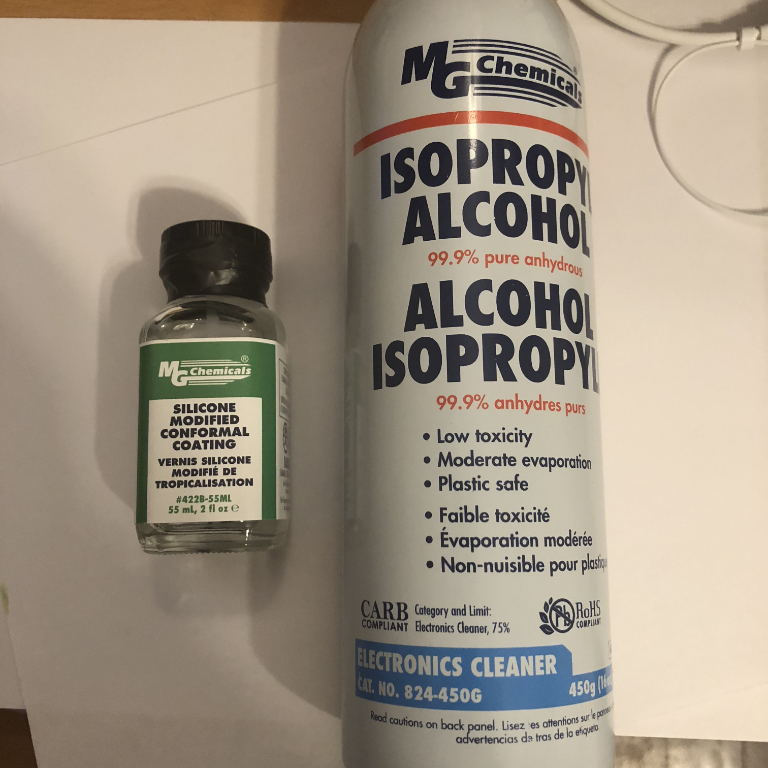 None of my electronics had a shine to them, meaning there wasn’t a conformal coating put on at the factory. What if my electronics already have a shine to them? Flying in any conditions basically. Key components here are Radio, ESC, Flight Controller, Camera Board. Even if all your circuit boards are coated, you will still need to clean your solder joints and then decide to conformal coat those solder joints also. The last indoor race I participated in was a barn, it was cool and a little damp. I decided not to clean off flux from soldering, and no conformal to see how well I would fare compared to other people. I had lots of other pilots said they land in puddles, fully submerged, would remove their quad and go fly again. ???? Wow what a statement, and they never cleaned anything, or conformally coated. I’ve never been this lucky with my electronics or had a quad that will fly great after going into the drink. What I do notice, is that so many budding pilots build a quad, fly it a few times, then give up and stop flying. There are lots of reasons for this. My only evidence to this effect is about 20 people show up at races to race, a few spectators, but I see and 800+ members in the local FPV group. Faith Quad: At that last indoor barn race, I started having problems flying my primary drone. 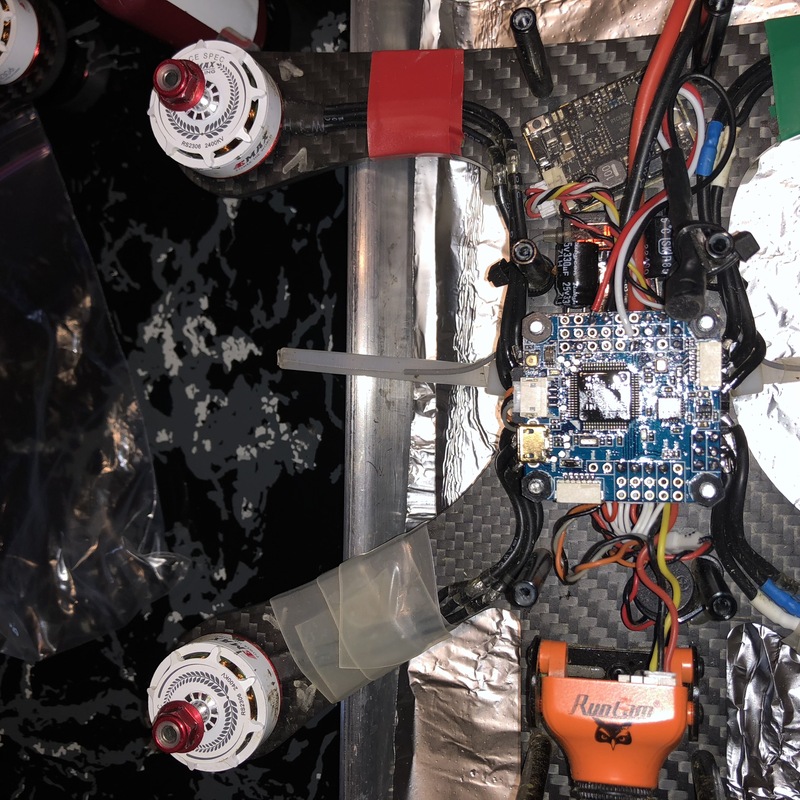 After a particular crash in the dirt, I air blew the electronics and motors. In the next race heat, my video started getting strange pixelation. Not like static, but like a loose connection or the OSD chip becoming faulty. In any case, it was disturbing my flying and I ended up in the bleachers when I went to land. Charity Quad: The video, the colors are a mess. After a good air cleaning the video on both quads was fine. They are in an indoor environment that is 70F with around 35 humidity. Conditions in which no clean flux would be ideal and not conduct or cause capacitance. I always use an old toothbrush with IPA since this helps get the electronics really clean. Conformal Coat all your electronics with Silicon Conformal. Acrylic conformal will work in a pinch, but over time I understand it develops cracks. Prefer silicon for long-term maintenance-free use. Dirt from the indoor arena can be blown off, and I don’t need to worry about it conducting and causing problems. A high humidity 95% – 100% and flying is ok. Flying while it snows is great. Landing in snow and getting buried, you can just pick it up, shake it off and fly again. Your shallow puddle landings are 50/50 however. If the wrong item gets dunked, you may be opening it up to dry out and or maintaining some motors bearings. Both drones work great, I tested them both today and both working great with their video feed. I will make a bold statement. 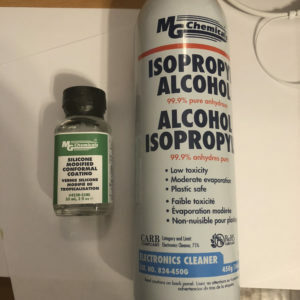 The electronics I’ve received that has been dirty with solder flux residues have issues until I clean it with IPA at the very least. Not all of it all the time. Experience has taught me that if you want perfect performance, you will just need to do at least a Flux Wash or IPA wash of the circuit board, and dry it out. This especially applies to communications based equipment which is what a quadcopter is. And experience has extended this to IoT devices, for higher reliability and fewer parts coming back as failed, clean your electronics after board assembly as well as soldering in circuit.